The perfect e-bike for long countryside treks the drop tube frame with 28” wheels gives a lower stand over height that makes getting on and off the bike easier and a commanding riding position and incorporates our Shadow Edge Down Tube technology that stiffens the frame and delivers a more comfortable ride. Bosch Performance centre drive motor system with the new Bosch integrated powertube 500wh battery that not only maximises distances between charges it also allows Corratec`s designers to produce an aesthetically pleasing frame design . Shimano XT 10 speed wide range gears and Tektro hydraulic disc brakes are just some of the highlights of this premium Trekking e-bike. Drop top tube frame built in T6 triple butted grade aluminium matched front suspension forks delivering a smooth and comfortable ride. 28” wheels shod with Continental E Contact II tyres with puncture resistant band and reflective side walls giving a comfortable riding experience. Shimano Deore XT 10 speed wide range gear system with rapid fire trigger shifters for precise quick changing in any riding situation. 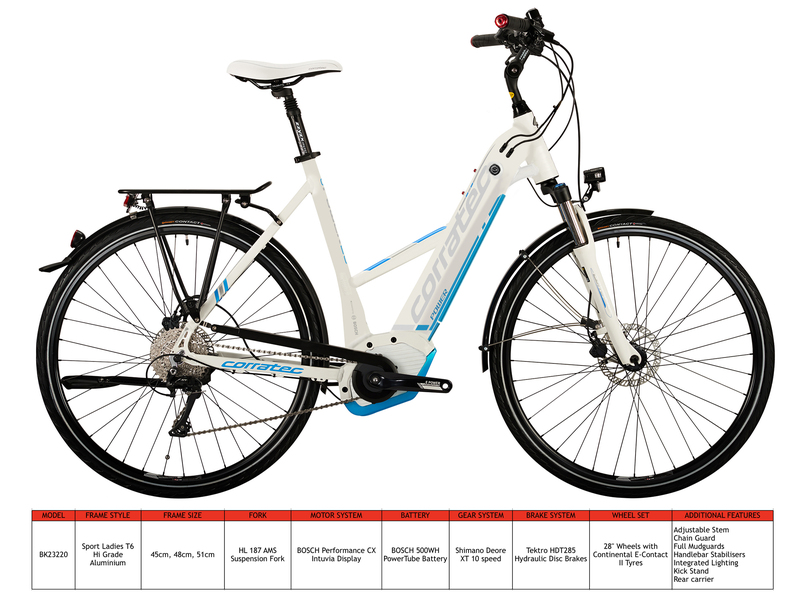 Full mudguard protection, Trekking Saddle with suspension seat post, chain guard and kick stand all go to make this a sporty Trekking bike.